Joanna Hope Strappy Maxi Dress is rated 4.4 out of 5 by 7. Exclusive to us - Joanna Hope. This great value maxi dress comes with a flattering illusion panel to both front and back to give a really slimming silhouette. 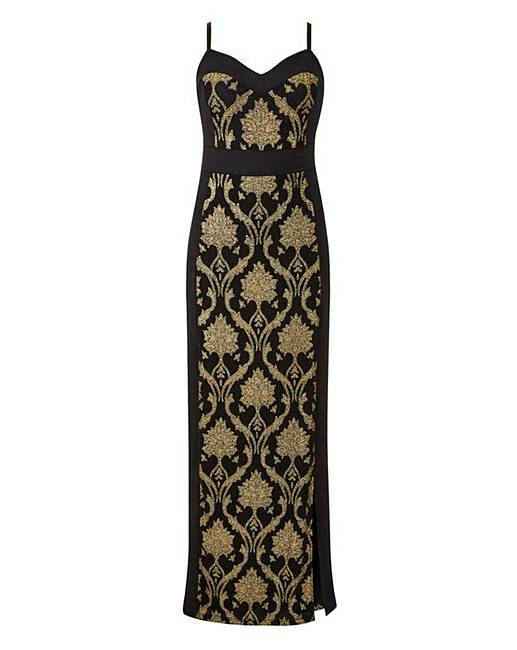 The design is a metallic baroque in super stretchy scuba crepe fabric - this dress features side split detail. Rated 3 out of 5 by Bon13 from Sizing is small Ok but sizing is small even tho i went up a size ! Rated 5 out of 5 by Bevwaste from NYE Cruise I bought this to wear NYE on a formal cruise evening. It was so comfortable and as I am only 5ft 1 " it was the perfect length on me so no shortening was required. I had many compliments. Rated 4 out of 5 by lanky from Lovely fit, very flattering I brought this 2 weeks ago for our Christmas party, I haven't worn it yet but I am looking forward to wearing it as it looks gorgeous on. Rated 4 out of 5 by Gillian from Looks good and very comfy Very comfortable and looks good on, the panel down the middle is very flattering. This dress is a good fit under the arms and over the bust; nothing shows that I don't want shown. The only reason I've given 4 stars instead of 5 is due to the material. It is stretchy so very comfortable but close up the look is not as expensive as I would have hoped. In saying that I still think this dress is value for money.